When it comes to high quality, unique, mind-expanding toys, Fat Brain Toys is where it’s at! As an educator and natural minded mother I really appreciate toy stores that can unlock imagination, open children’s minds to explore and create new things and can make learning fun. The moment I walked in I felt like I was a “kid in a candy store”. 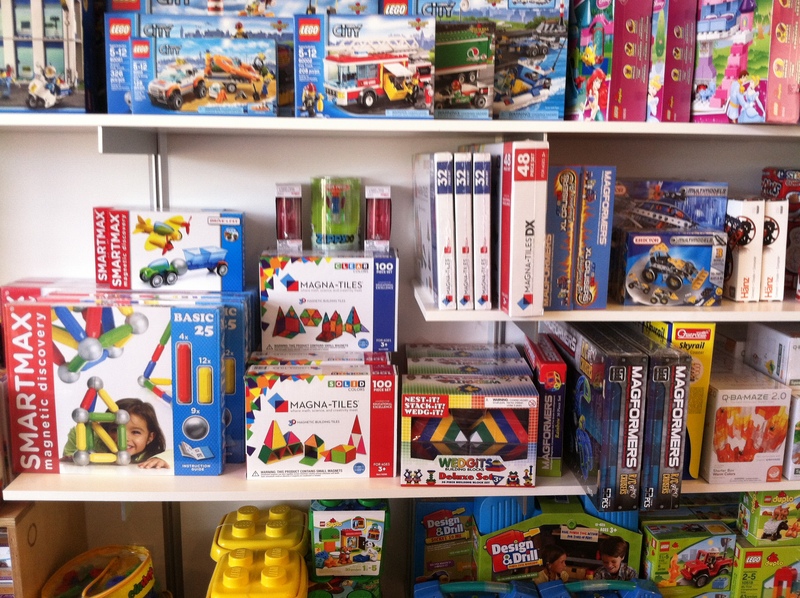 They have infant and baby toys, imaginary play toys, kites, dolls, books, puzzles, art and crafts projects, outdoor toys, magic and dinosour toys, board games, educational and building toys. The first thing that stood out to me when I walked in the store with my three kids were the hands on, display toys children (and adults) can play with in the store. I was so relieved to know that I wouldn’t have to keep saying to my kids, “Don’t touch that” as we walked around. The tall marble run kept my 4 year old busy for quite a while while my almost 2 year old daughter had fun playing with the fruit and vegetable stand. 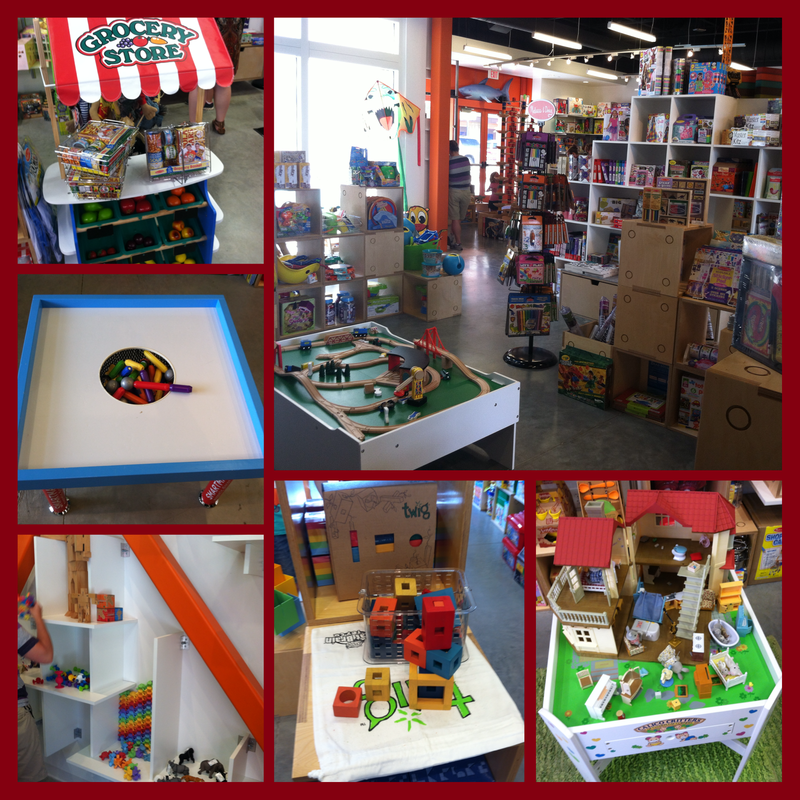 My kids loved walking around the store and seeing the building sets and other activities they could play with and touch. My son loves building toys, such as Magnatiles, Magformers and Smartmax. In fact, these are some of Fat Brain Toys best sellers! I discovered a new building toy that I fell in love with and can’t wait to get my son called, Twig. 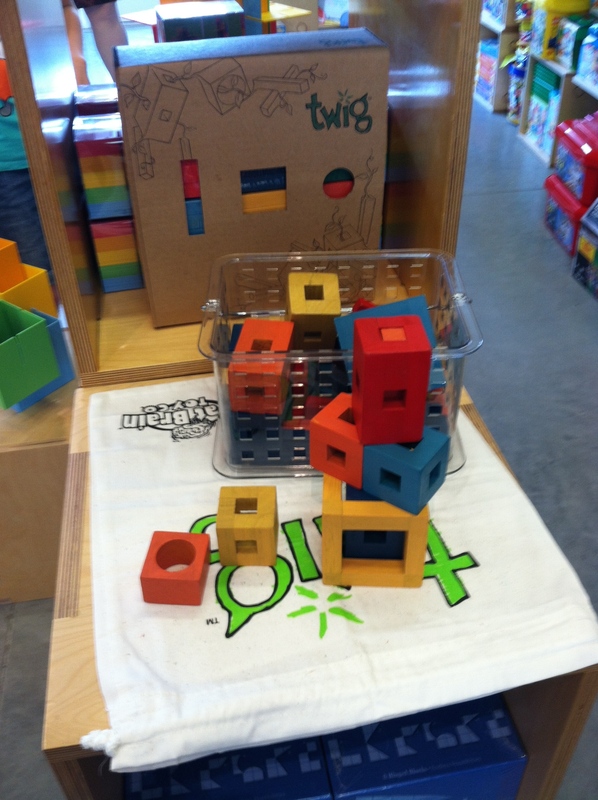 Not only do I think it is great because it is made of natural wood but I love the vibrant colors and how it helps develop visual spatial awareness as well as problem solving as you interchange the pieces together. I also discovered a great toy for both my 4 and almost 2 year old, called Squigz, which are squishy suckers that connect to each other and other hard surfaces. 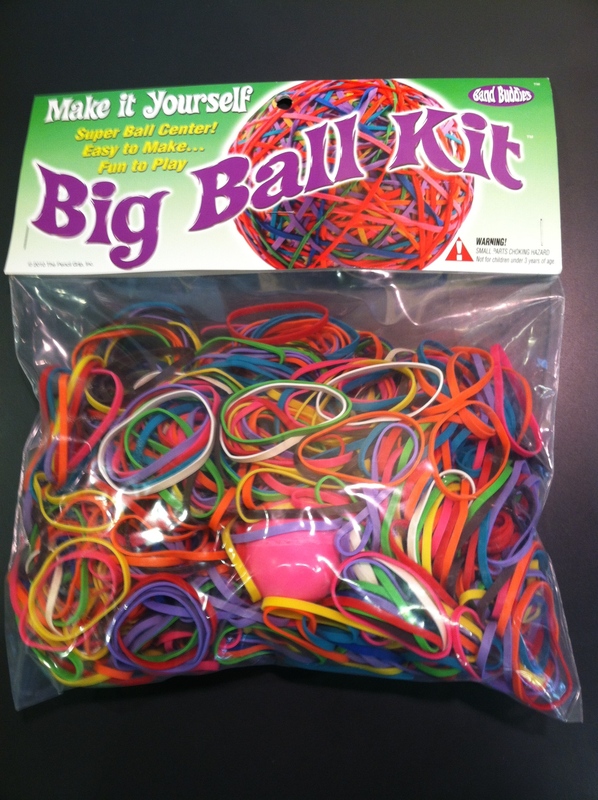 They are flexible, great for fine motor skills and are made from nontoxic, silicone rubber. I love that they can play with them on the table, in the bathtub, on the floor, highchair etc. I really appreciate “green”, nontoxic toys that are made through sustainable practices. 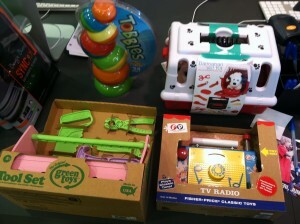 One of my favorite companies are “Green Toys” because they are eco-friendly and made from recycled milk jugs. My kids play with their big trucks all the time and love pushing them throughout the house, chasing each other. Fat Brain Toys carries a large selection of Green Toys! 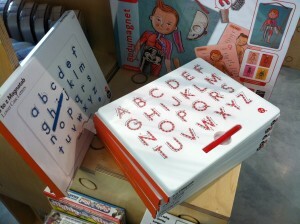 As a teacher I love when I see unique hands on, sensory, educational toys. Learning through play is my passion, so seeing their vast selection of these type of toys made me very happy! When I teach letters, I love using Wikki Stix so I was excited to see there is a card learning game that uses these “stix” to form the letters (shoot, I should’ve created it first!). Another company I love is Kid O, especially their Magnatab learning boards, because of the tactile and sound reinforcement. By using the magnetic pen, you pull the beads up to the surface of the board, as you learn how to correctly write letters (they also have them for numbers).The pop pop pop sound makes writing letters fun! 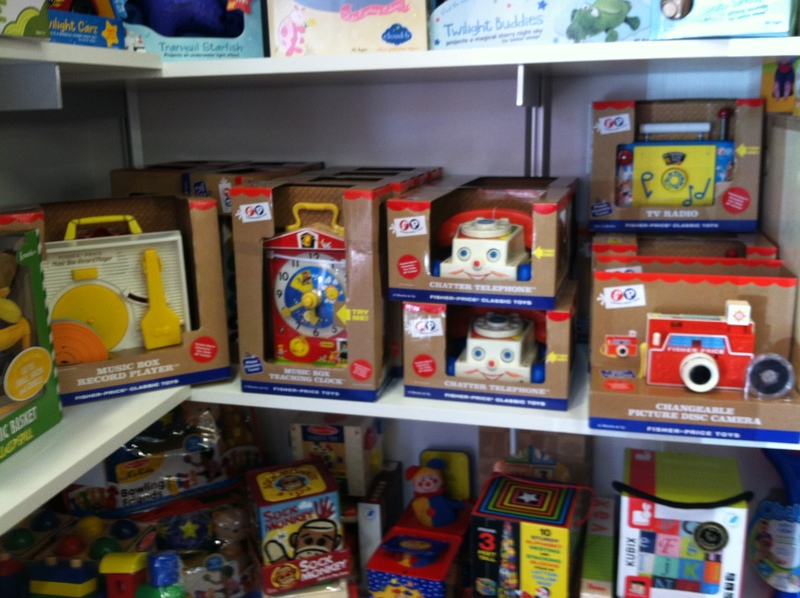 As I was walking around the store something unique caught my eye, a collection of classic “old time” fisher price toys, like a record player, TV radio, picture disc camera, chatter telephone etc. Since my niece’s 2nd Birthday is in a few weeks I thought there is no way I am leaving this store without getting her a gift! The problem was it was so hard to choose something because I wanted to buy the whole store! For her gift, I narrowed it down to Tobbles (great balancing staking toy), a Dalmation Vet Kit, Green Toys Tool Set or a Fisher Price classic TV Radio (that played “Farmer in the Dell”). In the end, I couldn’t resist the uniqueness of the classic TV Radio. I hope she will love it as much as I did when I was a kid! 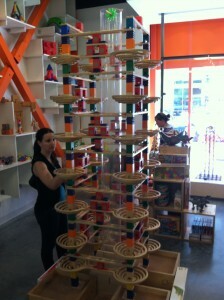 This store is fun, exciting and interesting for the whole family. If it wasn’t for my newborn’s blow out diaper, my toddler’s tantrum and an over tired four year old melting down, I could’ve spent hours there. The staff are very helpful and knowledgable and it is in an incredible location, Prairie Fire! The store is surrounded by various restaurants/bars, Pinstripes Bowling and Bistro, Cinetopia Movie Theater, Cocoa Dulce Artisan Chocolate, Rock and Brews Beer Garden and the Museum at PraireFire. 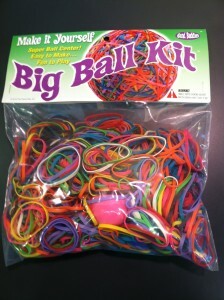 As I was checking out I saw a rubber band ball kit and I remember making one as a child. I thought this would be a nice”calming” toy for my son to play with at the end of the day, when we were getting ready for bedtime- I can’t wait to give it to him tonight and see what he thinks of it! They also have a great website and an impressive selection, where you can narrow your search by gender, age and price point. You can also search by category and interest. 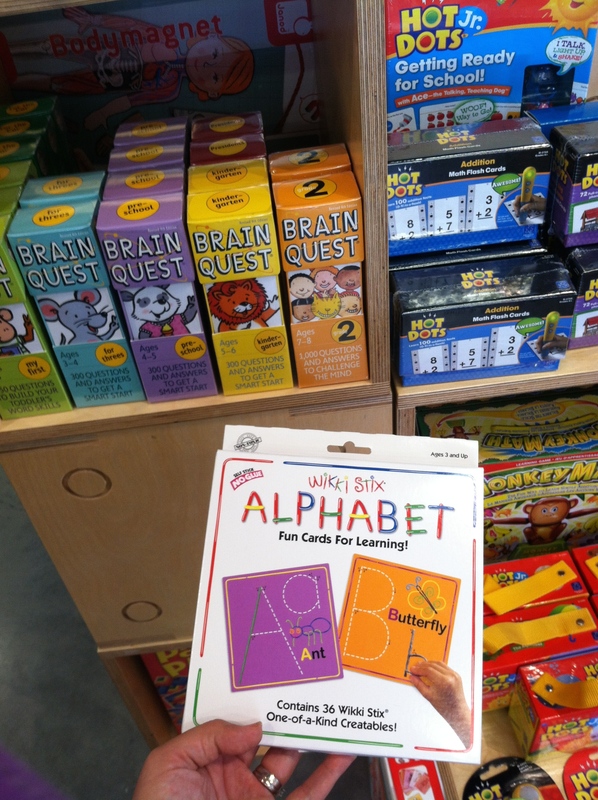 Enter below to win a $10 gift card for Fat Brain Toys! 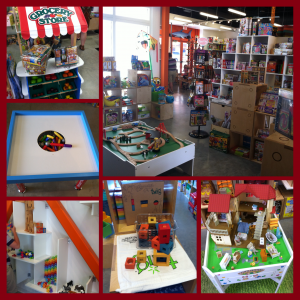 There is no toy store like this in Kansas City, I highly recommend checking it out! Prev My 3rd Birth Story	Next My new normal-crazy life with 3! 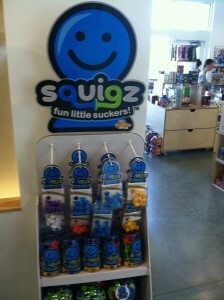 I love their toys as well and have been wanting to stop by that store. I drove by this store the other day and was curious about it. I will definitely have to check it out. It’s been closed the couple of times I’ve gotten over there in the evening, but I’d like to check it out soon. 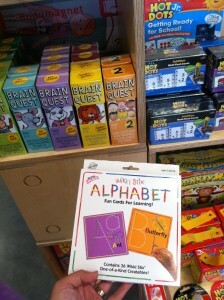 I’ll probably buy some building toys & some sight words cards or books. This place looks AMAZING!! I’m so excited to take Connor and love that it’s so interactive for little ones! 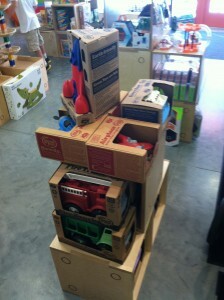 The building blocks and tables at their height are on our list!! Love this store. Have been once and plan to return. My daughter discovered Calico Critters while there, I’d probably start with a set of those.